Bandito Espresso is all about good food and even better coffee. We are convinced that organic and fair trade products really make a difference, both from an ethical and a quality perspective. Organising a special event or festival? Bandito Espresso will come to you in their get-away espresso cart, complete with cold drinks and fresh food. with a lovely quiet garden and cozy common room. also a great location for meetings and receptions. At Bandito we often do things different, here are some examples. We overdose every single shot of espresso. It might be a bit messy but this way we can fit the most coffee into your espresso. We work with vintage machines that are operated manually. That way we insure the barista’s fullest attention, shot after shot. We have our very own bandito espresso blend, roasted fresh every week and also available in smaller packages to take home. that disposable cups are more sustainable than porselain? Whatever you prefer, we offer both disposables and porselain. We couldn’t find organic coffee syrups so we started to make them ourselves. We are particularly fond of our unique saffran syrup. Our Fasos Bar will opened on several saturdays the upcoming period. So looking for that after party-pre-hungover-shot, a place to take your parents or enjoy a quiet study spot? Come stay with us at Bandito Fasos! 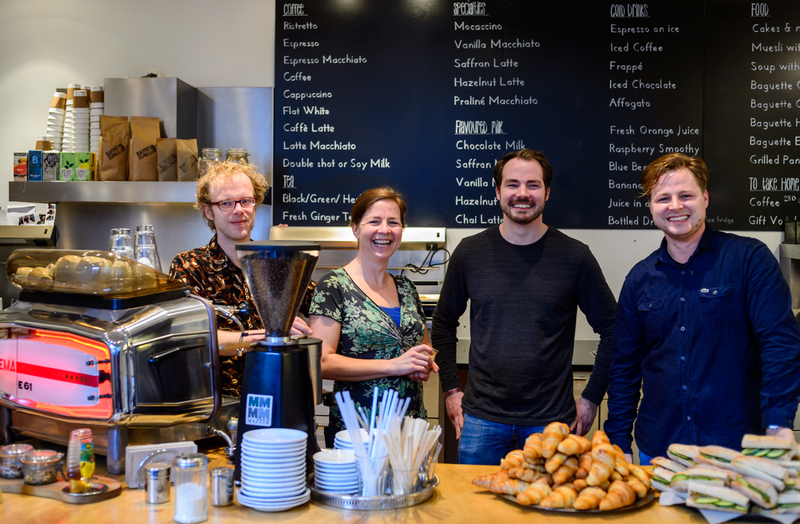 Foto's uit het bericht van Bandito Espresso Today is the last regular day at Bandito Randwyck, tomorrow we start the summer-season with limited times and a limited menu. So come enjoy Bandito to the fullest while you still can. Foto's uit het bericht van Bandito Espresso Our Fasos bar is closed until the 24th of August but our Randwyck location is open all summer! Come enjoy a coffee from Stefan, who will be running the Randwyck show while all the Banditos are off elsewhere. Foto's uit het bericht van Bandito Espresso Summer is near so remember our special summer times! Fasos closes after this Friday for the summer, until then we are open between 10 and 14 o clock. Tijdlijnfoto's Thank you for all the wonderful birthday wishes, gifts, kisses, cards and all the other ways in which you congratulated us on our birthday. We had a lovely day and really enjoyed welcoming so many of you. Tijdlijnfoto's From this monday Randwyck will open an hour earlier. So forget about daylight savings and simply come early for a rise and shine coffee. Tijdlijnfoto's Who is going to be our 2000th like? Tijdlijnfoto's This week you can find us at the Millerntor Gallery in the Decorfabriek. Come join us, it promises to be an amazing event! Tijdlijnfoto's Who needs holidays when there's cheesecake? Be quick before we eat it all ourselves. Bandito Espresso is bij Bandito Espresso. Tijdlijnfoto's Remember, from next week on our Randwyck location is only open from 10.00-14.00 o'clock. Take your time, hurry up, the choice is yours, don't be late! Tijdlijnfoto's This year our Bandito location in Randwyck will stay open the whole summer. Tijdlijnfoto's Bandito Espresso FASoS is closed for the summer holidays but don't worry, our Randwyck location stays open all summer! Tijdlijnfoto's Good luck with those exams and papers! And remember that fasos closes early this week. Make sure to come by before 14.00. We are a small business, run by the people that own it. When we are at the bar we dedicate all our attention to our food, coffees and guests, that is why we don’t have a phone number. If you want to contact us, please send us an email. After hours we take all the time to answer your questions.